What is cardiac robotic surgery? Cardiac robotic surgery is a form of minimally invasive heart surgery performed through small incisions in the chest. With the use of tiny instruments and robotic devices, our surgeons are able to perform heart surgery in a way that is less invasive than traditional heart surgery options. One of the main advantages of cardiac robotic surgery is that it minimizes many of the risks related to complex heart procedures. With robotic heart surgery, instead of going through your breastbone to get to the chest, your surgeon will go through tiny incisions. Robotic surgery is usually faster than traditional surgery, as well, thanks to the enhanced precision and speed of the EndoWrist® instrument. The EndoWrist design is based on the human wrist and its internal cables act like human tendons, but it has a greater range of motion than the human hand. 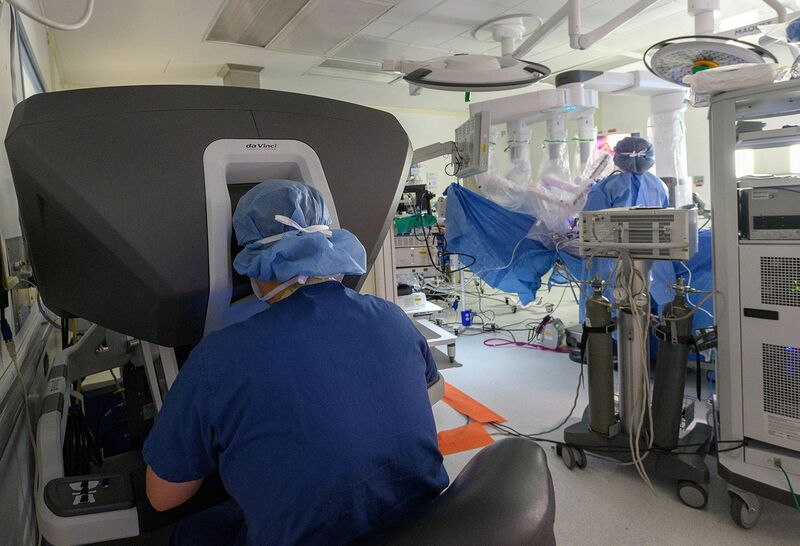 Robotic surgery is more than an impressive technological feat—it's a procedure that could save you pain, time and scarring compared to open surgery. Although cardiac robotic surgery requires the latest technology and highly skilled specialists, it’s pretty routine for us. After all, our physicians—who are among the world’s most experienced cardiothoracic surgeons who have developed and advanced the field of robotic heart surgery—have collectively performed more than 1,000 robotic cardiac procedures. Our achievements include performing the region’s first robotic closed-chest single and double-beating heart bypass surgery. Our tools create high-definition visuals of the heart, which allows treatments to be as precise as possible. Our care team includes physicians and health professionals from a variety of disciplines. They are specially trained in robotic surgery and have board certification within the field, which means you're being cared for by specialists who have undergone rigorous testing. You will be placed under general anesthesia for the surgical procedure and a breathing tube will be placed. Depending on the procedure being performed, several precision-guided robotic arms will be inserted into these incisions. These robotic arms hold and manipulate tiny instruments in order to perform the required tasks on the heart or surrounding arteries. A tiny video camera will be inserted into another incision to provide a magnified, 3D image of the operating site. The surgeon will control the robotic arms and camera from a special console located within the operating room. On completion of surgery, the surgeon will remove the instruments and close the incisions. Once surgery is complete, you will be moved to the recovery area to be monitored. You can expect a relatively short hospital stay to follow, usually half as long as following conventional open heart surgery. Your doctors will typically discharge you once your pain is under control, you can retain liquids without nausea and vomiting, and you pass a number of lab tests. The less invasive nature of robotic heart surgery also means that you can expect less scarring on your chest. This procedure just leaves a handful of smaller scars, as opposed to the 10-inch scar possible with conventional surgery. Your doctor will typically schedule follow-up appointments after the procedure to check your progress. Be sure to notify your doctor immediately if any symptoms occur after the procedure, such as chest pain or discomfort. After your surgery, complications are rare but possible, so it is important to carefully monitor for any symptoms and report them to your doctor.